A light bulb flashed as a group of Girl Scouts absorbed a new lesson: some bulbs consume less energy than others. 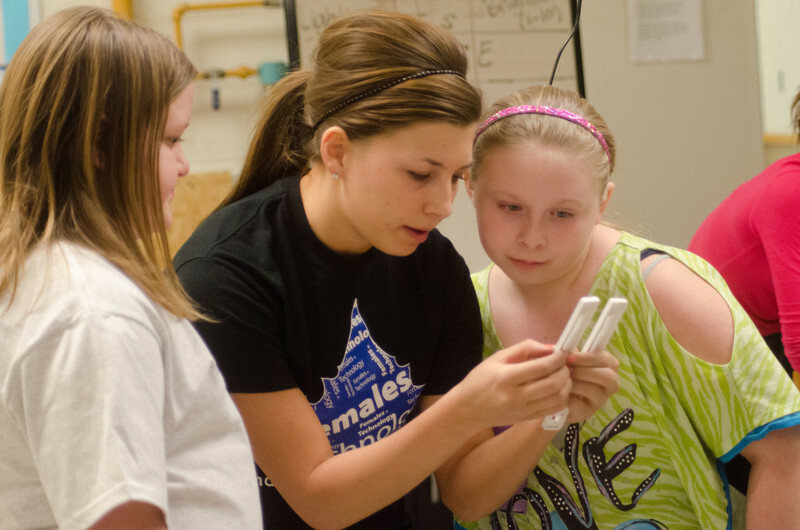 The elementary fact taught in a college classroom was part of the collaboration between the Females in Technology (FiT) student group at Indiana State University and the Girl Scouts of Central Indiana on Get Moving, a national Girl Scout initiative in which scouts learn more about energy through lessons and activities. The FiT members at Indiana State organized the activities and classroom sessions for the five-week long Get Moving program in Terre Haute. "We thought this would be a good fit to work with Females in Technology because they have helped and collaborated with us in the past on some previous programs," Donna Polky, regional membership director for the Girl Scouts, said of the initiative that includes math and science activities and lessons for an audience of fourth and fifth graders. 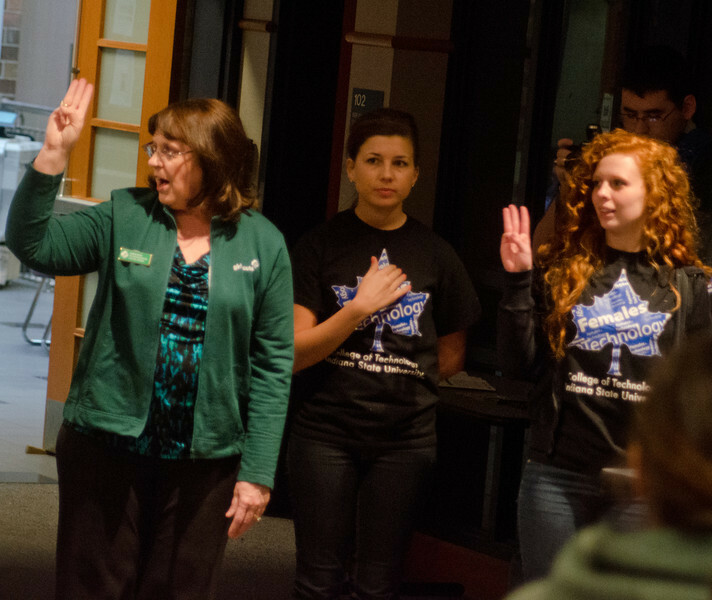 FiT and the Girl Scouts previously collaborated on single-day events. FiT members did not know what to expect for the multi-week program, so they limited the number of scouts who could participate to about 40 - a number that was quickly reached. Nearly two dozen more scouts expressed interest in joining the program, said Molly Joseph, a junior technology and engineering education major from Paris, Ill., who is president of Females in Technology. "I wasn't expecting that, because in the past, we just haven't had that many" scouts attend events, said Joseph, who also helped organize several of the sessions. "Maybe if we do this again next year, we could handle 60 girls. Just because it's a first year, I didn't want to go over 40." Each of five sessions focused on a different aspect of energy, with the scouts working on activities to reinforce what they were learning. Students learned about energy efficiency during one of the lessons -which included the light bulbs - and toured John T. Myers Technology Center at Indiana State to check for places where cold air might be leaking into the building. The scouts have enjoyed the lessons, with some of them talking about the program on the ride home and even at school the next day, said Karen McQuilkin, a Girl Scout troop leader and mother of one of the participating scouts. "They've applied (the lessons) in a fun way that (the scouts have) been able to retain that information," McQuilkin said, "so it's rewarding as a parent to see that." Several scouts from McQuilkin's troop participated in the Get Moving program. She encouraged scouts to join after reading that it would cover a variety of topics and be taught by women at Indiana State. "I think sometimes girls from different backgrounds think ‘Well, that's for somebody else. I'll never go to college,'" McQuilkin said. "I wanted them to be exposed to other girls who have had the opportunity and see that if you make it a goal, then you can do whatever you set your mind to." The troop leader's daughter, Emily McQuilkin-Briggs, enjoyed the program, including when the scouts made homemade paper during a session that taught them about recycling. She liked "that we all got to help make it, and we all got to do our own craft," said McQuilken-Briggs, who is a fifth grader at Riley Elementary School. The Indiana State students also have learned from the program. Joseph, who plans on becoming a teacher after she graduates, has been able to hone her skills. "Just speaking in front of the girls, that has helped me so much," she said. "Also I have to teach them how to do the activities because they've never done them before, so that's also helpful, too." FiT members also have been able to utilize some of the College of Technology resources, including a robot, in teaching the scouts about energy. The program has gone very well, both for the college students leading the sessions and for the Girl Scouts, some of whom have developed friendships with several FiT members, said Michelle Stinchcomb, a sophomore mechanical engineering technology major from French Lick and vice president of FiT. "I didn't know how interested they would be, honestly, because I know I wasn't thinking about things like technology when I was their age ... but they really seem to enjoy learning about it," Stinchcomb said. "They are intelligent and eager to learn." While no future plans have been made, the participants consider the inaugural Get Moving program a success, and one of the most successful collaborations between Females in Technology and Girl Scouts of Central Indiana. "Our main goal is to help them develop those leadership skills and those skills they'll need throughout their life, so we have to find what it is specifically that is keeping their interest," Polky said of Girl Scouts of Central Indiana. "If FiT can help get more young girls interested in science and technology, then it's a win-win for everyone." Photo: http://isuphoto.smugmug.com/Events/FIT-program-Get-Moving/i-vzg78Kx/1/L/DSC_5395-L.jpg (ISU/Jamil Buchanan)Kassi Smith, an Indiana State University student and member of Females in Technology (FiT), works with two Girl Scouts during the Get Moving program at Indiana State. FiT teamed with Girl Scouts of Central Indiana to organize and host weekly sessions of the five-week long program that taught fourth and fifth grade scouts about energy. Photo: http://isuphoto.smugmug.com/Events/FIT-program-Get-Moving/i-d4kt5H4/1/L/DSC_5318-L.jpg (ISU/Jamil Buchanan)Donna Polky, left, of Girl Scouts of Central Indiana; along with Kassi Smith and Molly Joseph, Indiana State University students and Females in Technology members, during the Get Moving program. The Females in Technology (FiT) student group and the Girl Scouts of Central Indiana colalborated on Get Moving, a national Girl Scout initiative in which scouts learn more about energy through lessons and activities.